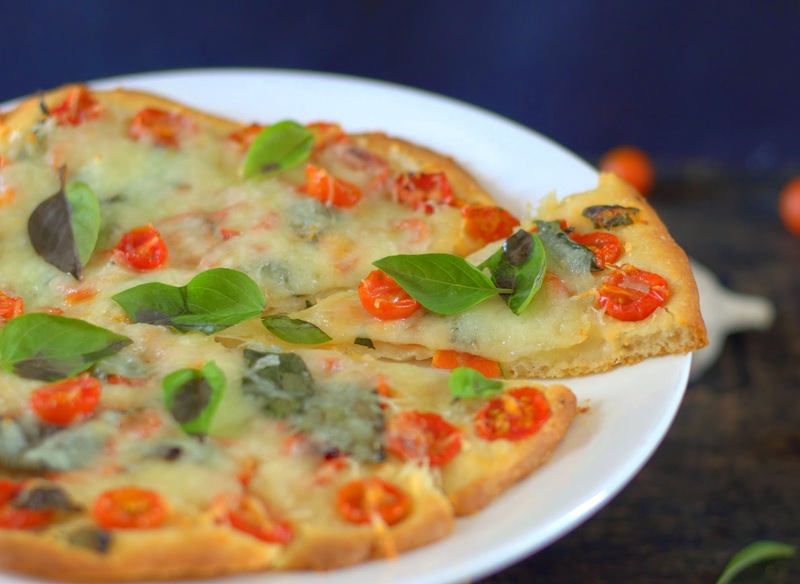 Gooey, stringy cheese melting on a crisp thin crust warm from the oven. Flavorful home-made tomato sauce and fresh basil. As fresh as it can be, home-made pizza! I have ended up baking pizza 3 times last month as I love feeding people the made from-scratch-ones. Surprisingly I had not made pizza for my family though I have been making them since quite some time. So recently it was a jalapeno flecked one for my father who loves his food hot. And then again for my sister for whom making pizza at home was an intimidating thought. Of course I had to show her that it was not! When I bake pizza at home, it often surprises people that the crust can be good too. More reasons for me to try out more recipes! My favorites are Peter Reinhart's amazing crust when I can plan well ahead. Cold flour, cold water and a really slow rise in the fridge. The really quick No-Knead Pizza when I need pizza in a hurry. Just dump all ingredients in a bowl, give 20 energetic stokes and pat the dough right on the pan. 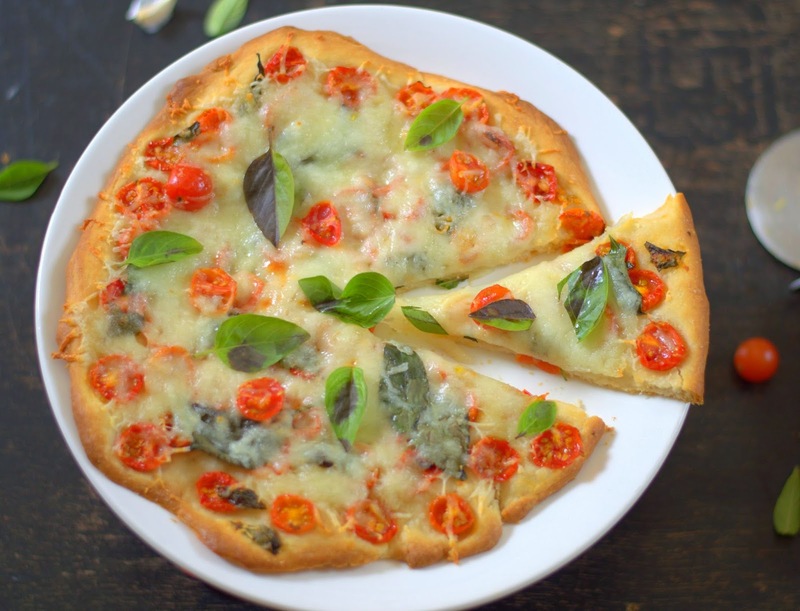 Pizza from inspiration to the table in 1 hour! And now Pioneer Woman's pizza crust for times when I have just enough time and energy to stir the dough and dump it in the fridge. Refrigerate and use it over the next 3 days. Just the dough for times like super busy weekdays followed by your child's birthday party over the weekend. I like a crust which tastes good, bakes up thin, crisp and crunchy. And Ree Drummond's easy recipe gives you just that. Her pizzas feature this crust often, so we can safely assume it is a favorite. Indeed, when you have a good crust, the toppings are only limited to your imagination! Grilled Eggplant, Tomato and Basil or Three Cheese or Pesto and Grilled Vegetables or Harissa, Roasted peppers and Cheese - well, just about anything you fancy! A real pleasure for those who take the pains to bake at home. 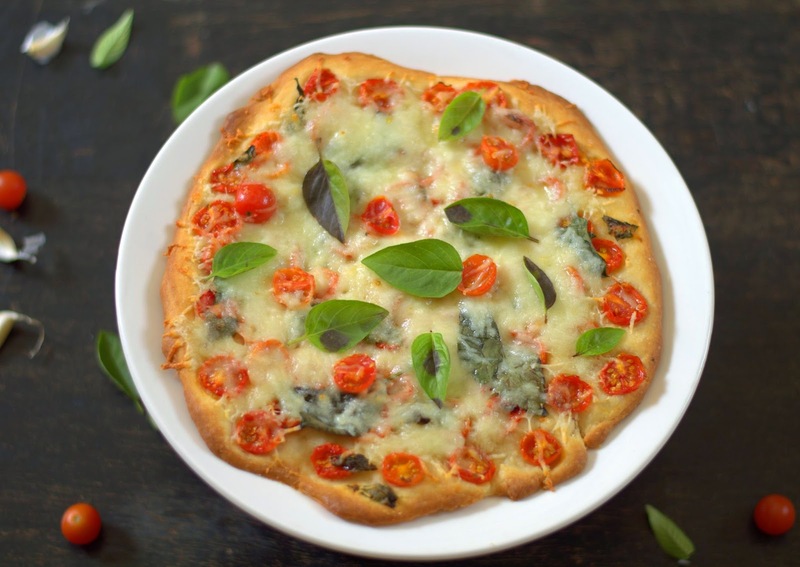 Here is Ree's crust topped with with tomato sauce, garlicky cherry tomatoes, basil and mozzarella which is merely a suggestion. Please do have it your way! PIONEER WOMAN'S EASY NO KNEAD PIZZA CRUST. Recipe here. The below proportions make a quarter of the recipe on her site. Ingredients: To make 2 thin 9'' crusts or one large pizza. Double to make 4 nine inch crusts. Grease your dough rising bucket lightly but thoroughly. You need one large enough to hold the dough when it doubles. Whisk the salt and flour, keep aside. Take the water in a medium sized bowl. Add the yeast, stir to mix, add the oil next and mix. Tip in the flour. I used my Danish whisk to mix. You can stir with a wooden spoon or mix with your hands. The dough will look like its crumbly at first, but it will come together fine as you mix. Do not add more water in a hurry. Better to err on the side of the dough being less sticky than making it too sticky or wet. Place the dough in a greased dough rising bucket, close the lid leaving it very slightly open. The dough will almost double in the fridge gradually. Topping: I have used homemade pizza sauce, cherry tomatoes tossed in garlicky extra virgin olive oil, herbs, salt and pepper and basil. To make the pizza : Invert two 9'' round or square tins, grease well using a teaspoon of oil for each pan. Do not skimp as this is important for a crisp crust and easy release of the pizza. Remove the dough from the fridge, it would have firmed up. Using a dough scraper divide it into 2 equal parts. Hold the dough in your stretch and pull gently. Then place it on the pan. Push the dough around gently and spread to make a thin circle or square. If the dough resists, go back to it after a couple of minutes and then spread. Try to keep the thickness uniform as much as possible. Patch any holes. Start pre-heating the oven to 250 C (or higher if your own has a setting) 10 minutes after you pat the dough on the pan. After 30 minutes, top the puffed up crust with slightly thickly sliced vegetables of your choice. Cherry tomatoes cut side up here. Bake the pizza for 13-15 minutes or till the crust is a dark golden at the edges. The time may vary depending on the oven. Watch carefully as the pizza will burn quickly at this temperature. If you lift the pizza the bottom should look golden and crisp. If it is not done yet, put it back for a minute or two more. Carefully remove the pizza (still on the pan) from the oven. Do not turn the oven off. Maintain the temperature at 250 C.
Spread tomato sauce evenly. Top generously with grated mozzarella and fresh basil leaves. Bake for 2 more minutes or till the cheese melts. Careful again as the cheese tends to turn hard if over baked. Remove from the oven. Let the cheese set for a minute. Slice with a pizza cutter and serve immediately. Of course within that one minute you will put the next pizza to bake! The first pizza will tell you if its baked long enough. If it is not crisp enough, bake the next one a minute or two more before you top with cheese. Please note : Ree uses lukewarm water for the dough, recommends using the dough after at least 24 hours in the fridge. She bakes the pizza soon after spreading it on the pan, I let it rise for 1/2 an hour. If your oven sets at a higher temperature, your pizza will bake faster. I find Amul mozzarella much better than other brands, though its been a bit inconsistent in quality a couple of times (like the cheese here). I prefer to bake the cheese for just 2 or 3 minutes at most as I find it turns rubbery when baked longer. Different crusts for different pizza emergencies . You can never have enough in your repertoire, can you? Which is your favorite crust? pizza looks sooooo tempting and beautiful. Wish i get this cheesy pizza rite from the screen, so delicious. Want to know if this will turn out well in a convection oven, do not have an OTG. I have a pizza base crisper, so can I use that instead? Hey Suma, made it today and it turned out awesome, though my oven sets highest at 200 C. Thanks so much for all the detailed info. Everyone just loved it :) .